🔁 via @theofficialamorphous: "(Link in bio). ‘AALIYAH - The Inside Look’ premiered on YouTube two days after Aaliyah’s death anniversary, as a loving two hour fan-made documentary created by myself. Though it used footage from various media outlets, and music from Aaliyah’s and many other artists’ catalog that I clearly do not own, the film was non-profit and made to showcase Aaliyah’s life, the way it should be documented and celebrated. Also, all of the footage/music that was featured in the film is available on YouTube, uploaded by people who clearly do not own the material as well. A day after the documentary was released to rave reviews & media coverage, over twenty-five thousand views and endless comments praising the film, Reservoir Media (Merlin), removed the film from YouTube due to “copyright infringement”. Reservoir had already given my account two strikes twice just days before, for sharing my Aaliyah mashups with the world. Thus, my entire account was removed from YouTube. Many fans, including myself, feel that this is a personal attack on me. All of Aaliyah’s music is uploaded to YouTube by people who clearly do not have the “rights” to upload them. Plenty of mashups including the same exact songs that I used are still up with millions of views. This is unfair. This does not make sense. 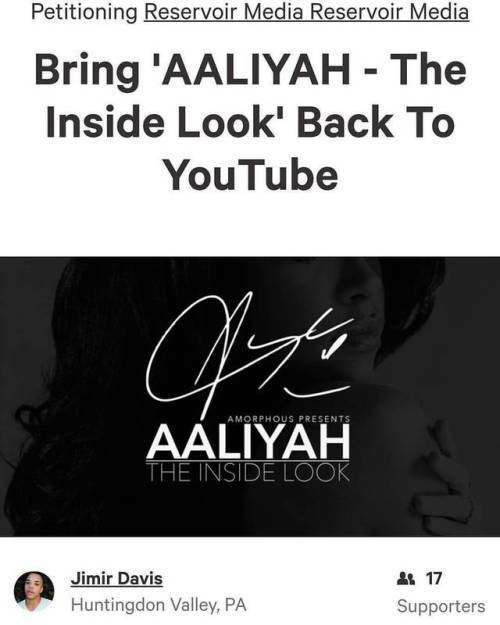 Though available on www.aaliyahtheinsidelook.com releasing the fan-made documentary to YouTube was the most logical way to get it seen by as many fans as possible. I am asking Reservoir to retract their copyright infringement claims, and allow the release of the film. If you truly enjoyed 'AALIYAH - The Inside Look’, I ask of you, truly, to sign this petition. Her story deserves to be told the right way. #Aaliyah"